Do you remember how magical Christmas was when you were a child? Remember fighting off the Sandman, desperately struggling to stay awake at the chance you might catch a glimpse of Saint Nick? Every rustle…every bump…made you jolt from your quilted pod and race to the living room where the lit tree posed, draped in soft light. Still no Santa. It took all your energy to climb back into bed with your eyelids drawn and your body heavy. Tucked back in as best as you could--sheets and pillows slightly disheveled—you dozed off while musical thoughts filled your head. A wide, animated grin filled your face as you dreamt of chilly nights of caroling and warm, fire-lit sing-a-longs. Music has always been an integral part of the holiday season. As everyone knows, there is no better way to celebrate than with song. Re-live your childhood memories and share your love of music this holiday season with the Christmas Favorites for Accordion only from Santorella Publications arranged for accordion by Jay Latulippe. This spectacular title features an assortment of all your favorite songs including those unforgettable Johnny Marks tunes from the animated television special “Rudolph the Red-Nosed Reindeer”. 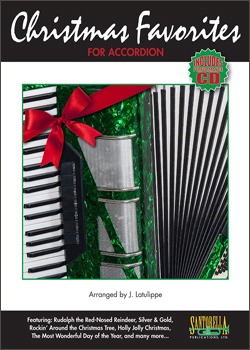 This 64 page collection of the 30 most requested holiday favorites arranged for accordion include suggested fingerings, register markings with lyrics and chord symbols. This popular Santorella Publication is truly most comprehensive collection of Christmas Songs in print for accordion today! Away in a Manger • Carol of the Bells • Deck the Halls • First Noel • Go Tell It on the Mountain • Good King Wenceslas • Hark! The Herald Angels Sing • Holly Jolly Christmas • I Saw Three Ships • It Came Upon a Midnight Clear • Jesu, Joy of Man’s Desiring • Jingle Bells • Jingle Jingle Jingle • Jolly Old St. Nick • Joy to the World • Let There Be Peace on Earth • O Christmas Tree • Come All Ye Faithful • Holy Night • Little Town of Bethlehem • Rockin’ Around the Christmas Tree • Rudolph the Red-Nosed Reindeer • Silent Night • Silver & Gold • The Most Wonderful Day of the Year • Twelve Days of Christmas • Up on the Housetop • We Three Kings • We Wish You a Merry Christmas • What Child Is This?